Network Fun!!! -- A Security/Network Engineer's Blog: Brocade VDX: What Is A Breakout Cable And How To Configure For It? Brocade VDX: What Is A Breakout Cable And How To Configure For It? It's not as hard to grasp once you see it. It's a 1 QSFP to 4 SFP+ (40gig to 10gig). Notice the larger 40 gig side on the left, and the four 10 gig on the right. Can u pls explain configuration ? Basically, when you configure with the "sfp breakout", you are telling it "make 4 sub interfaces on fortygig 1/0/50. It will look like "fortygigabitethernet 1/0/50:1, 1/0/50:2, 1/0/50:3, and 1/0/50:4". They will only have 10gig capability, not 40gig at this point. thank you shane, clear now. I know this was posted a while back, but I need to get some of these and I'm getting lost in all the combinations available! 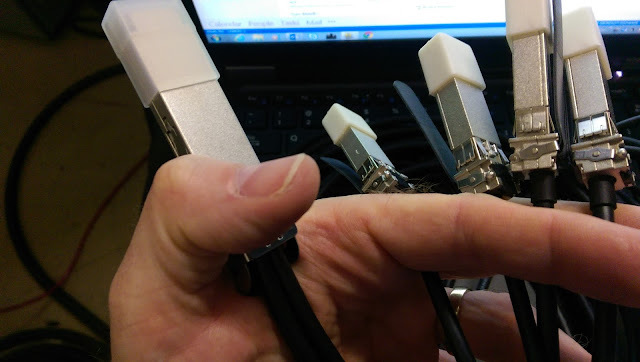 Are the sub interfaces treated as individual 10Gb interfaces, so I could connect 4 separate servers to the breakout cable? or can you only use them to connect 4x10Gb to another switch? You can break out the 40g ports to 4 10g ports. You have to have the break out cable to do this.